A French gage with the classic gage-like flavour, yet whereas most gages prefer warm climates, Oullins Gage also grows well in the cooler climates of the UK and northern Europe. Rated by the noted Victorian writer Hogg as having "exquisite flavour and handsome appearance". The fruit is large by gage standards - more like a small plum, with a semi-clinging stone. It is a particularly attractive golden colour, with faint red dots - very pretty in a fruit bowl. Oullins Gage is equally good for fresh or culinary use. Eaten fresh, the flesh is sweet and gage-like - and far better than most shop-bought plums. For culinary use, pick slightly early when it is still firm. The flavour of Oullins Gage is also fairly consistent between seasons. Please fill in the details below and we will let you know when Oullins Golden Gage plum trees are back in stock. The traditional English green gage. A well-known early-season plum - Oullins gage is one of its parents. An English green gage, and an interesting complement to the yellow Oullins gage. 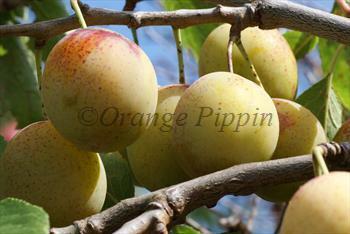 A popular yellow gage-like plum with a good flavour. One of the so-called transparent gages - you can sometimes see the stone through the translucent flesh. Oullins Golden Gage is in flowering group 4. Oullins Golden Gage is self-fertile and does not need a pollination partner, although fruiting may be improved if there is a compatible tree of a different variety nearby. Compared to most gages, Oullins Gage is easy to grow and will succeed in more northerly climates than is usual for gages. Oullins Gage has a tendency to be slow to come into bearing, and if left to its own devices it is not unusual for the tree to be 4-5 years old before it begins fruiting. The fruit is certainly worth the wait, but you can also take steps to speed things up a bit! One of the reasons for the delay in fruiting is its growth habit, which is vigorous and upright - it may help to gently tie down new side branches to give a more open appearance, and this will also encourage earlier fruiting. Similarly, once the tree has clearly established itself in your garden, be wary of over-feeding it, as it will respond by growing even more - rather than fruiting. Oullins Gage is also a good pollinator for other mid- or late-flowering plums and gages. According to the English author Hogg (writing in the 1880s), the exact origins of this variety are unknown but it was first marketed in the 1860s by M. Massot, a nurseryman from the town of Oullins, near Lyon in France.